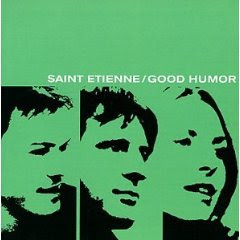 The Stark Online: Saint Etienne - "Good Humor"
Saint Etienne - "Good Humor"
After some afternoon beers, we sat down and put this record on. What came through the speaks was a well-produced, well-mixed and tightly engineered, soulful-pop album; shedding electronic beats for a full band sound, Saint Etienne dip well into the 1960s psyche-pop realm and pull out a winner. While a bit front-loaded, this album was a pleasant surprise equipped with jazz flute, crackling snare hits and spot-on vocals. You can do a different type of dance to this record; save the Jersey shore fist pump and repleace it with a twist, or hell, a shout. Roll your head in a circular motion, arms akimbo and dance. We were happy with this buy. Very happy. Go forth and find this record, buy it and love it.